This apprenticeship-styled, minimum 60-hour Aromatherapy Certification Program qualifies you to join The Preventative Health Services Group and obtain insurance to practice and make products as an aromatherapist anywhere in Canada. 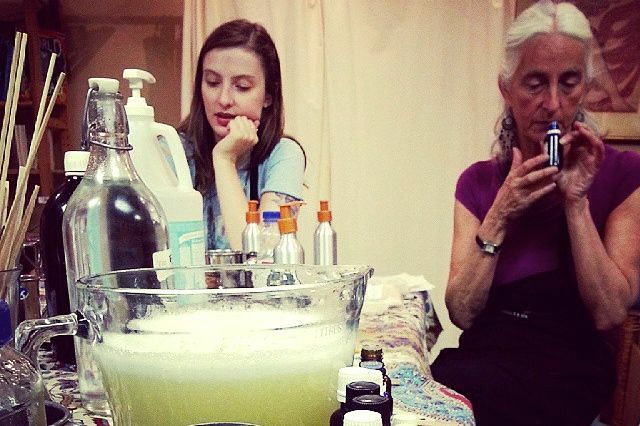 LOCATION: All Workshops and Practicum take place in Toronto at Anarres Apothecary, 1076 Bloor St W M6H 1M6. Projects can be done by correspondence but must be presented at Anarres. NOTE THAT ALL INSTRUCTION HOURS CITED BELOW ARE PAYABLE IN MONIES OR IN WORK EXCHANGE. In all areas, certification requires a grasp of the theoretical and practical aspects of the subject. In other words, participation in a workshop does not guarantee that you qualify for the certification hours. Products and work completed from the workshop will be required to be presented. The cost of the Program is based on how you choose to pay for the hours. 1. There is a $60 Application Fee, refundable only if I decide not to enroll you in the program. 2. PREPAY WITH WORKSHOPPER CARDS If you purchase three Workshopper Cards, the cost of the program is the lowest. PAY AS YOU GO If you pay for the workshops individually, your cost will be as high as $2250. Individual workshop discounts apply for Advance and Bring-A-Friend registrations. Taxes apply to all fees. WORK EXCHANGE If you are accepted for Work Exchange, you will pay for your program in hours worked for Anarres Natural Health. You will contribute two hours of work per Workshop or Program Hour until you demonstrate proficiency and reliability, generally after a few shifts. Your Aromatherapy Certification will reflect the number of hours you worked. There are a limited number of spaces available for Work Exchange. You must be able to commit to a weekly schedule of a minimum of 4 hours per week, be reliable and punctual. Please meet with me in person to negotiate Work Exchange. You may be placed on a waiting list. Work Exchange provides additional learning, but its primary purpose is to support Anarres Apothecary, and so involves unexciting tasks such as cleaning along with learning experiences. Your work must be efficient and at the level of paid employment. I reserve the right to terminate Work Exchange at any time, with credit for any hours worked up to termination. 1. Complete an "Order" below paying the NON REFUNDABLE $60 Application Fee, not payable with hours or Workshopper Card. 2. Send by email a recent photo, website or Facebook link, and 1 paragraph answers to the following questions: What do you want to learn most in your program? What Gifts will you bring to your program? What challenges will you bring? Once I receive your Order, and Application email, I will contact you to book you for a short interview, and tour of Anarres Apothecary.